Medical interns, nurses under training as well as full-fledged professional surgeons and doctors are direct beneficiaries of the ALC. 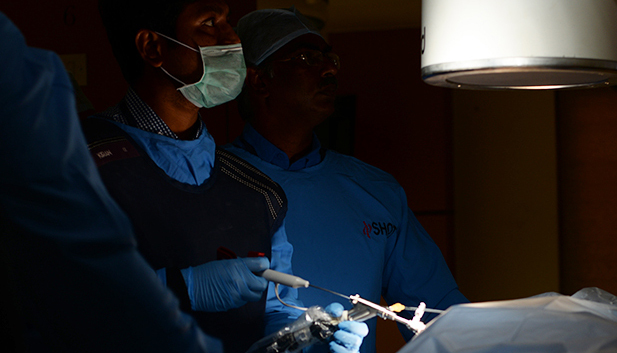 Beyond Ramaiah personnel, staff from other hospitals and the medical community at large benefit from the institution's implant validation programmes and frequent workshops. Through mannequins, models and simulation techniques, undergraduates, graduates and nursing students are taught the basics of surgery, Trauma Life Support, Advanced Cardiac Life Support and other skills. This lab prepares and hosts cadavers that act as 'near-life' specimen. This helps medical professionals hone and advance their skills. The 'Live Well, Leave Well' initiative encourages individuals to donate their bodies for the progress of the medical community. The facility is large enough to allow multiple courses to be conducted simultaneously. Multi-specialty staff use ALC's resources to conduct a wide variety of surgeries including abdominal surgery, ENT surgery, neurosurgery, joint replacement, arthroscopy, laparoscopy and others. ALC has a well-equipped multimedia centre that can cater to a 100 people at a time. This allows surgeries to be beamed onto screens or relayed via videoconferencing facilities.